Southern Coyote Buttes, Arizona-Utah border. Photo Credit: Patrick McDonald. Click the image to open the Colorado Plateau gallery. The Colorado Plateau is centered on the four corners area of the Southwest, and includes much of Arizona, Utah, Colorado, and New Mexico. 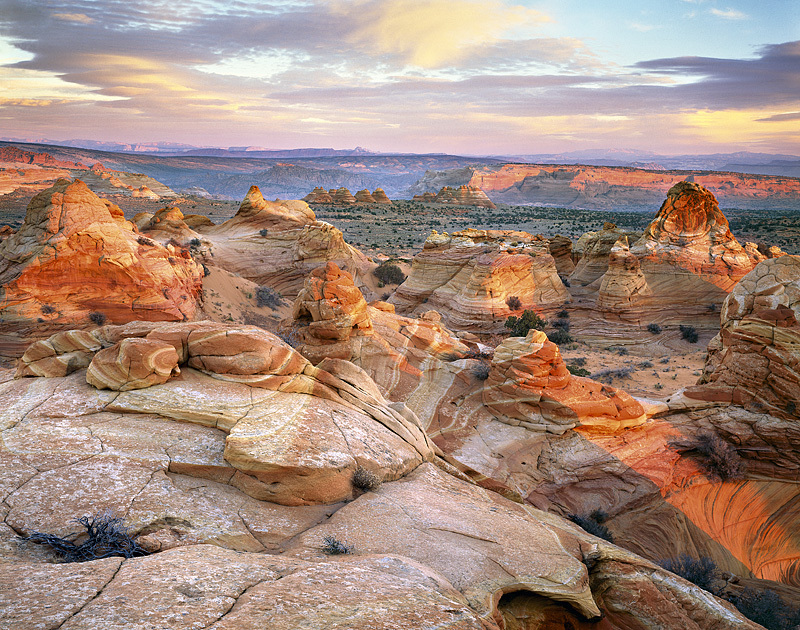 Originally named by John Wesley Powell, the Colorado Plateau comprises a series of tablelands (plateaus or mesas) located within an immense basin surrounded by highlands. Stream valleys that are typically narrow and widely spaced dissect the region, as do larger valleys, including the most spectacular – the Grand Canyon. Prehistorically, many of these valleys were the homes of prehistoric farmers. The environment of the canyon bottoms was so different from the rest of the Plateau, however, that it is explored separately under the “River Environments” link on the right. Area: 390,000 sq. km. (150,580 sq. miles). Precipitation: Averages 20 cm (8 in) per year. Temperature: At the lower elevations of the Plateau, temperatures range from the low 20s to the mid-90s F. At higher elevations, summer temperatures rarely exceed 70 degrees, and winter temperatures in the single digits are common. Elevation: The mean elevation on the Plateau is 1,936 meters (6,352 feet), but the elevational range of Plateau includes canyon bottoms at less than 750 meters (2,461 feet) and mountain peaks a staggering 3,840 meters (12,600 feet) above sea level. Life Zones: Primarily the Upper Sonoran and Transition life zones, but featuring Canadian, Hudsonian, and Arctic-Alpine zones at the highest elevations. Vegetation: At low elevations, the Plateau is covered with arid shrublands and grasses, with sagebrush as the dominant plant species. Higher elevations bear woodlands dominated by pinyon pine, juniper, and shrubs. Higher still, montane forests dominated by ponderosa pine, Douglas fir, lodgepole pine, and aspen cover the land. Geology: Primarily sedimentary rocks formed tens of millions of years ago. Sandstones, shales, and limestones are common, as are fantastic rock formations molded by wind and water. Volcanic rocks are also common in those areas of the Plateau with volcanic history, such as the Hopi Buttes, Sunset Crater, and the San Francisco Peaks. Prehistoric Cultures: Ancestral Puebloan, including the ‘Anasazi,’ Sinagua, and Cohonina. National Parks: Glen Canyon, Rainbow Bridge, Grand Canyon, Wupatki, Sunset Crater, Walnut Canyon, Petrified Forest, Hubbell Trading Post, Navajo, Canyon de Chelly, Yucca House, Mesa Verde, Aztec, Chaco, El Morro, El Mal Pais, Bandelier, Petroglyph, and Salinas Pueblo Missions.